Shopping for a new or used truck can be intimidating; there are so many options available and things to consider that by the time you think you have it figured out, you realize there are a dozen more choices you never even knew about. Even just deciding one thing, like choosing a Toyota, still leaves a lot of questions unanswered and barely begins to narrow down the field. As you look at different Toyota trucks for sale and options, it can be hard to know what information is useful and important, and what is just white noise taking up advertising space. With a little help and foreknowledge, however, the truck-buying experience can be far less mysterious and intimidating. Knowing what to look for, and what the information you find actually means, empowers you to make an informed decision. 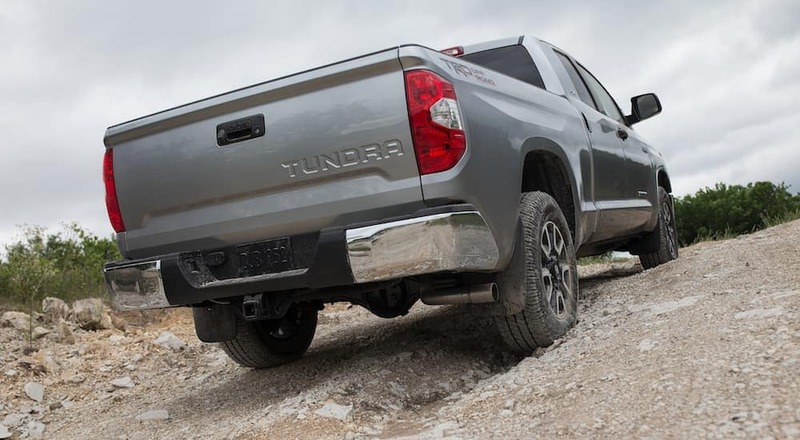 When looking at Toyota trucks for sale, you will usually see descriptions of the engine in a format such as “5.7L V8 with 381hp and 401 lb.-ft. of torque,” which happens to be an available engine for the 2019 Toyota Tundra SR. For a lot of people, that string of numbers and letters is about as useful as an algebra equation in Greek. While you can simply know that bigger numbers = more power, it’s also helpful to know what it all actually means. The first part, “5.7L,” refers to the meaningful size of the engine – it’s a measurement of the total size of the cylinders; a larger number means a bigger engine. The next part, “V8,” refers to the design and number of cylinders – this means there are 8 cylinders arranged in two rows in a v-shape; each cylinder in an engine produces power, so more cylinders mean more power. Then there is “381hp,” which means the engine produces up to 381 horsepower. While measuring the force of an engine in terms of the power a horse can produce may be archaic, it makes it easy to compare different engines. It is essentially the raw amount of power an engine can produce. In some ways, the torque is more important than horsepower, which in the example above was “401 lb.-ft.” Torque is expressed in pound-feet or pounds-per-foot and measures pulling power, which is what accelerates your vehicle. Higher torque in Toyota trucks for sale means better acceleration, which is important if you are interested in towing or hauling large cargo loads. Speaking of towing or hauling cargo, there are three things to look for and understand when it comes to towing performance of Toyota trucks for sale. “Towing capacity” refers to how much weight a truck can pull behind it, and that includes the weight of any trailer or other item that loads are placed into. This number is often increased through more powerful engines, and truck designs that better distribute load weight. “Cargo capacity” means how much weight can be loaded directly into the bed or box of the truck itself. This is different from the towing capacity and comes down to how much weight the axles of the truck can handle. Upgrades like dual rear wheels and other design choices can increase the cargo capacity of a truck. Finally, there is “GVWR” or Gross Vehicle Weight Rating. This is a very important value because it indicates the highest total weight a Toyota truck can handle – including the weight of the truck itself, any accessories, cargo, and passengers. Going beyond this rating is very dangerous and can cause serious damage to the vehicle. Fuel economy is pretty simple and indicates the average distance Toyota trucks for sale can travel per gallon of fuel. You will usually see this expressed as two different values, such as “15/19 est. mpg” or “15 mpg city and 19 mpg highway.” This indicates that a truck can travel about 15 miles per gallon when driving in the city, and 19 miles per gallon while driving on the highway. These estimates are based on the fact that highway driving is typically at higher speeds and involves fewer starts and stops, which conserves gas compared to driving in a city. As you look at different Toyota trucks for sale, you will usually see references to available or included “packages.” These are bundles of features that come with certain models and styles of trucks or may be available for an additional cost. For example, some Toyota trucks might have a “Trailering Package,” which usually includes accessories and features designed to improve hauling a trailer or other towed cargo. Other packages can consist of additional technology options, more safety features than are included in a standard model, and accessory packages that include things like gear for camping or exterior details. The term “trim” is used to refer to pre-customized variations of a single model of vehicle. 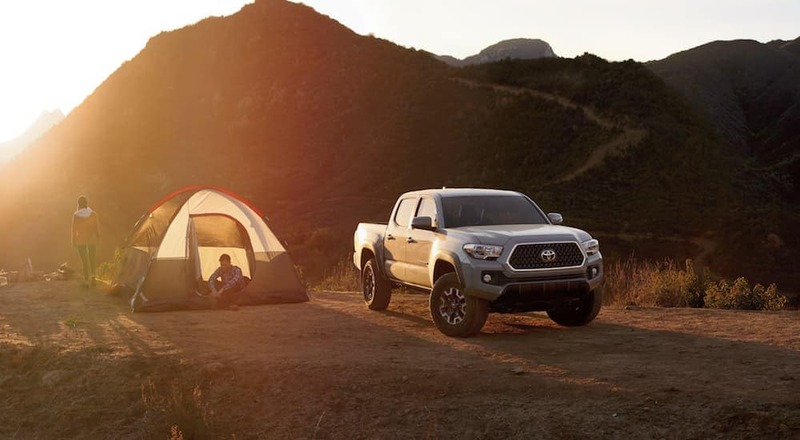 For example, the 2019 Toyota Tacoma is available in three different trim levels: the SR, the TRD Off-Road, and the Limited. All three have the same engine, the same transmission, and are built upon the same frame – they are all Toyota Tacomas. But the SR and Limited have the same driver information display, while the TRD Off-Road includes an inclinometer that indicates pitch/roll, which is helpful while driving off-road. Meanwhile, the SR and TRD Off-Road both have air conditioning as standard features, while the Limited has dual-zone climate control standard, and it’s an option for the TRD Off-Road but not the SR. When looking at different trim levels of Toyota trucks for sale, it is very important to look at the interior options available. This will give you information about things like the Infotainment center, indicating the size of the screen and if Navigation is available or included, as well as air conditioning and steering wheel controls. The interior options can also include details about how the seats are made, if they are cloth or include leather, how adjustable they are, and whether they are heated/vented or not. At the same time, you also want to look at exterior options of the vehicle, though details about the outside of any Toyota trucks for sale may be more limited. If you are interested in aesthetic details, then you can certainly consider the color of the truck and details like door handles. In general, however, look at how the tailgate opens – it could be automatic and programmable or manual, and features like remote door locking or remote stop/start. These may seem like extravagances while looking at different vehicles, but over time you will appreciate having such features available to you. Of course advances in technology have greatly changed how cars and trucks are designed. Look for things like Bluetooth connectivity, 4G LTE Wi-Fi hotspot functionality, and Navigation systems in any Toyota trucks for sale that you are interested in. 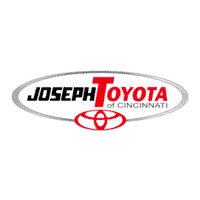 These kinds of things are usually available at different trim levels, and they can greatly improve your experience driving a new Toyota truck. Safety features have also improved with technology. Things like rear-facing cameras have become legally mandatory in new vehicles, but other improvements are also commonly available. Front and rear park assist can help with parking, while lane change alert can make it easier to stay in your lane while on highways.